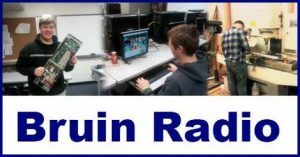 Bruin Radio is a weekly student-led and student-written news show produced by Brookings-Harbor High School staff, and supported by Curry Coast Community Radio. May’s not over yet, and there’s still plenty happening! Our students react to a news story taking place in our own State, not far from Brookings. We discuss upcoming events like Mr. BHHS, Scholarship Release Night, and more. This episode features audio editing work performed by Tommy Jones of Brookings Signs and Graphics, the Chetco Pelican Players, and more. Thank you Mr. Jones for volunteering your time! 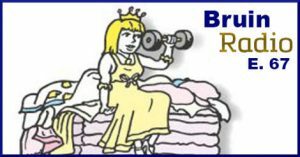 Don’t miss interviews of Cast and Crew of the upcoming Once Upon a Mattress play included in this special show! 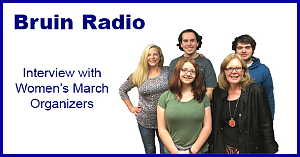 This week’s Bruin Radio scoops include Rotary and Interact news, an entire segment on what Michelle Prudden is up to, as well as awesome Robotics updates and student interviews. We’re always looking for feedback, so if you haven’t told Bruin Radio what you think, tell us this week! The Bruin News intro music is from the Prelinger Archives on the website archive.org, and is released under the Creative Commons Public Domain license. The full show from which the Bruin News intro music was taken can be found at: https://archive.org/details/0596_On_the_Air_20_09_04_00. This is the full, online version of Episode 51, and it’s yet another dynamite episode packed with real news. Our in-studio guest is Carl King, who discusses his work as a member of the Curry County Budget Committee, his efforts with measure 8-76 and the Home Rule Charter, his support of current Measure 101, and much more. 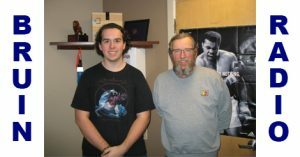 Click HERE If you would like to listen to only the full interview with Carl King. Bruin Radio journalists also report on the January 20th Brookings-Harbor Women’s March. Student newshounds are on-site interviewing organizers, protesters and counter-protesters. We read signs and play the audio from the preparatory meeting and the street march itself. Click HERE If you would like to listen to only the Women’s March content. If you would like to download these files, depending on your operating system, try right-clicking the link and selecting ‘Save As’ to save the audio. Our student journalists interview two organizers of the Brookings-Harbor Women’s March. Our discussion gets to the heart of the goals of the March, the rights that its participants are marching for, and the perspectives of organizers and marchers on political topics. Don’t miss our weekly local and school news segments in this episode either! If you’re a student or staff member and you’d like to get involved, or if you’re a community member with input or advice for Bruin Radio, please reach out to us! E-mail Dane Tippman or Alex Merritt of the Brookings-Harbor High School. We would be thrilled to hear from you! Suicide is preventable. There is help and you are not alone. People around the world have adopted the symbol of a semicolon in their clothing, imagery, and tattoos to signify they too have struggled with thoughts of ending their life. We want to remove the stigma so that people who are struggling with thoughts of suicide can understand they are not alone and there is help available. In this special episode of Community Organizer Gordon Clay and Scott Clapson talk about Project Semicolon, suicide awareness, and efforts in our community to remove the stigma around suicidal ideation. You are not alone and there are people who can help and ready to listen. If you are in crisis right now in Curry County you can call 24 hours a day 1-877-519-9322. You are not alone. In this episode of LGBTQ Spotlight, Paul Hempel and Scott Clapson talk about HIV, the importance of HIV testing, the stigma around HIV, and the healthy life opportunities that result from early detection of HIV infection. They discuss Paul’s involvement with Cascade Aids Project in Portland and other volunteer work, including building a relationship with HIV Alliance in Eugene. 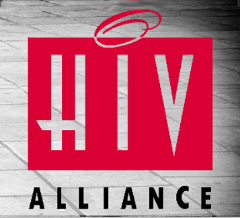 The HIV Alliance is a Eugene-based nonprofit organization.They will offer free oral HIV testing on Sunday September 27 from 2:00 to 4:00 PM downstairs at St. Timothy’s Episcopal Church, 401 Fir Street, in Brooking. A special thank you to St. Timothy’s for providing the space for this important program. You can follow the local LGBTQ community at the Facebook sites LGBT Crescent City, Brookings, Gold Beach and PFLAG Gold Beach. 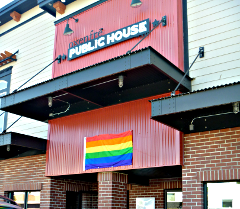 To celebrate the one year anniversary of the LGBTQ dinners at Oxenfrē Public House in Brookings, Susan Reaves and Scott Clapson talk about bisexuality, coming of age in the San Francisco’s Castro District, activism, and why visibility is important. Susan shares with Scott about being an “arm chair activist”, and after listening to this podcast that’s hardly the case. You can follow the local LGBT community at the Facebook sites LGBT Crescent City, Brookings, Gold Beach and PFLAG Gold Beach. 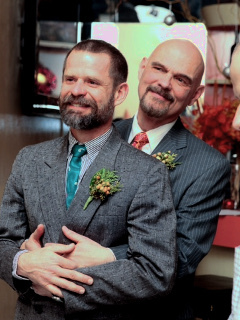 In the wake of the recent U.S. Supreme Court decision making marriage equality the law of the land, LGBTQ Spotlight host Scott Clapson talks with Curry County residents Paul Hempel and Bruce Newman about their lives as a married couple who happen to be gay. Paul and Bruce’s current passions and travels. Thank you Paul and Bruce for sharing your stories and being so open. In this edition of LGBTQ Spotlight, host Scott Clapson has a lively conversation with Rachel Patterson, Jacob Patterson, Stephanie Wenning, and Kyle Clausen about their local Crescent City community group, Gender Talk. Gender Talk’s mission is to promote gender and LGBTQ equality, and provide a safe space for representation, discussion, creativity, and expression. Gender Talk was founded two years ago by Rachel and Jacob after they returned to their home town of Crescent City. Their goal was to create something that was missing when they were growing up: a support system for young women and LGBTQ youth, and a venue to educate youth on issues of equality. 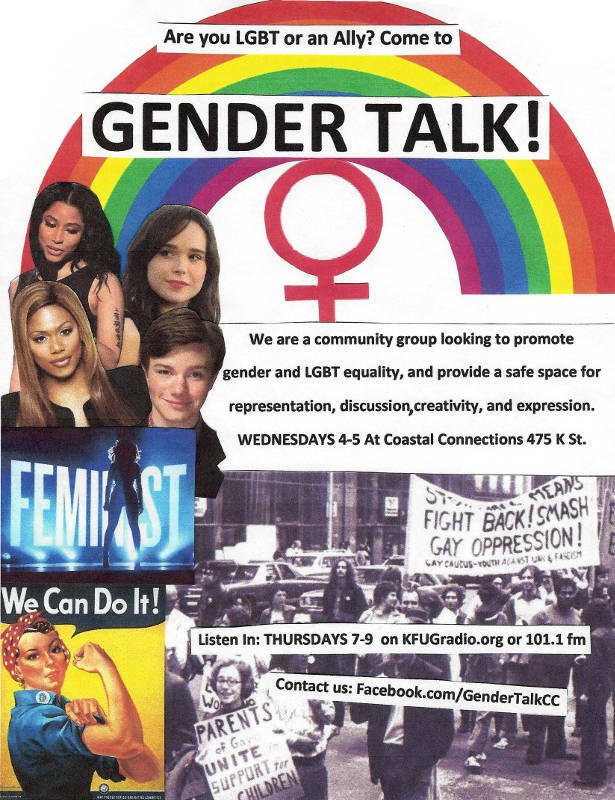 Gender Talk has weekly meetings every Wednesday from 4:00 – 5:00 PM at Coastal Connections in Crescent City. Each meeting is focused on a piece of popular media. Clips taken from television, movies, music videos, commercials, etc., are used to initiate a discussion around familiar images demonstrating that issues of equality are everywhere. By showing the intersection of gender, sexuality, race, class, and ability, Gender Talk hopes to encourage open-mindedness and acceptance of diverse identities. 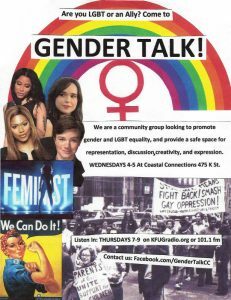 Building on their weekly meetings, Gender Talk has branched out to include a weekly radio show on KFUG (a community supported FM radio station in Crescent City), a quarterly publication, and a partnership with CASA of Del Norte County. This year they look forward to their first Summer Youth Media Campaign. They welcome community involvement and invite anyone who wants more information or would like to participate to contact them at gendertalkcc@gmail.com or on their Facebook page, facebook.com/GenderTalkCC. You can follow them on Instagram and Twitter at gendertalkcc. Don’t miss this lively conversation with these energetic young people who are making a difference in their community. 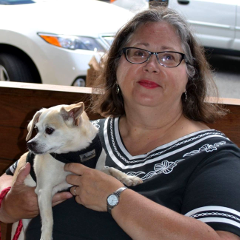 In this edition of LGBTQ Spotlight, host Scott Clapson talks with Gold Beach City Councillor Tamie Kaufman about being out in a small coastal town, internalized homophobia, and volunteering for community engagement. Tamie is a long term resident of Gold Beach. 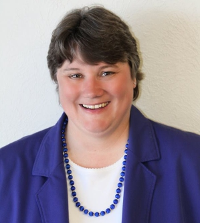 She is a member of the Gold Beach City Council, a property manager, and a member of the Gold Beach Chapter of PFLAG.